The Buhari school certificate scandal might just be put to rest now. obtained five credits in English Language, Geography, Hausa Language, History, and Health Science. PREMIUM TIMES obtained the computer printout from Cambridge University as well as a statement of result, signed by the current principal of Katsina College, dated January 21, 2015. The results show that Mr. Buhari, a former military head of state, failed in Mathematics and Woodwork, and had a pass in Literature in English. 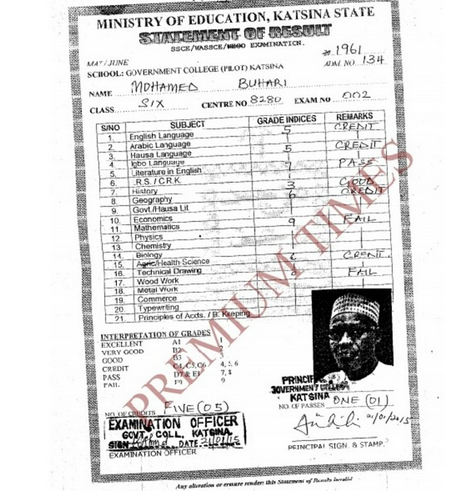 The examination centre number was 8280 while Mr. Buhari’s candidate number was 002.